We are housed in a 40,000 sq. ft. indoor slab showroom, conveniently located off of Miramar Road at 9855 Distribution Ave., Suite 100. With the largest selection in South California of natural stone, engineered stone and glass slab, our showroom contains over 300 different materials. 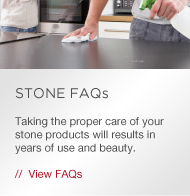 Choose from Marble, Granite, Quartzite, Limestone, Onyx, Travertine, Basalt and Slate, to suit your needs. Our location also features a conference room available to designers, architects, and contractors to meet with their clients.